I grew up in an upper-middle class family in a suburb of Los Angeles. 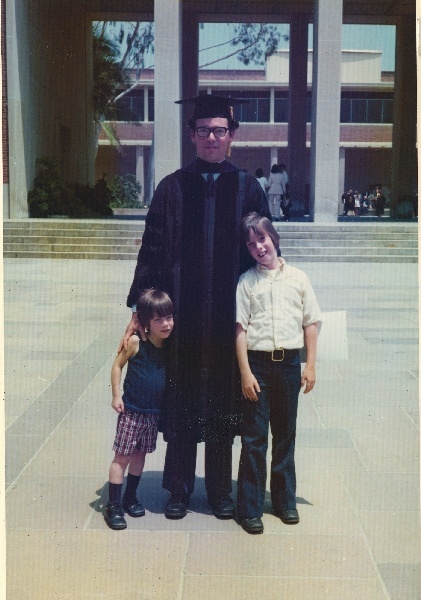 My father earned his Ph.D. in electrical engineering from UCLA when I was five; my mom went to college part-time at CSUN, and finished her bachelor’s degree in English a few years later. Three of my four grandparents went to college. My paternal grandfather owned his own pharmacy; my maternal grandfather had a law degree, but was employed as a railroad worker. (My mom blamed the Depression for her father’s failure to find work as a lawyer). My family lived in a nice single-family home with a swimming pool. However, my parents were always frugal. We never bought new cars until I finished high school, our vacations consisted almost entirely in camping, and my weekly allowance was $.05/per year of age (later I bargained for a raise to $.07/per year of age). Their fiscal restraint allowed my parents to invest in real estate, buying several homes as rental properties. I went to public school for my entire K-12 education, with the exception of 4th grade, when my parents put me in a private Greek Orthodox school to avoid being bussed. I was always a good student, and fortunately, my elementary school offered ability tracking beginning in first or second grade, if I recall correctly. By junior high, I considered non-ability-tracked classes to be not only a waste of time, but very distressing. The “regular kids,” as I called them, were generally anti-intellectual and impulsive. There wasn’t much physical abuse, but there was a lot of emotional abuse, and the less I saw of the regular kids, the better. Many readers will attribute my school performance and attitudes to my class background, but this is a deep mistake. True, virtually all of the students in my ability groups came from middle-class families. But most of the “regular kids” were middle class too, and I always saw my older brother, a mediocre student, as one of the regular kids. Furthermore, both of my parents discouraged my elitist attitudes, but I just ignored them. My friends growing up all came from roughly the same social class as I did. The class background of my friends diversified only after I went to college. My best friend from my undergraduate days at UC Berkeley was the only son of immigrants from Latin America. My best friend from my time as a graduate student at Princeton came from a very poor family in the Poconos. But our class differences made no difference to us. Our common intellectual interests, values, and sense of humor were the glue of our friendship. My childhood would have been much worse if I had grown up poor, but frankly, I doubt that my adult life would have been very different. As long as I had enough to eat, poverty per se wouldn’t have bothered me much. But based on my experience with non-ability-tracked classes, I would have been friendless and bored out of my mind. (These days, perhaps, I could have found solace on the internet at a public school or library). By the time I finished high school, though, there would probably have been plenty of scholarship money available for me. Even if there weren’t, I would have been fanatically motivated to put myself through college in order to escape from my origins. You could say that growing up poor would have stifled my mental development, but I doubt it. Twin and adoption studies show that childhood environment has little or no long-run effect on IQ. You could say that growing up poor would have changed my attitudes. But I’m a difficult person to mould. I’m an atheist despite sixteen years of my mother’s Catholic indoctrination. If anything, I think that growing up poor would have made me more elitist than I already am, just as growing up Catholic made me more impious. For my adult life to have been radically different, I would probably have needed to grow up in an absolutely poor family in the Third World, not a relatively poor family in the First World. My instinct in that situation would be to learn English and migrate to the U.S., but immigration restrictions would get in the way. This realization is part of the reason I have so much more sympathy for immigrants than I do for low-skilled Americans. What if I had grown up rich? Again, I doubt it would have changed much. I would have gone to the Ivy League instead of UC Berkeley, but it’s not like Berkeley held me back. Perhaps I would have been less ambitious if I came from a rich family, but who knows? From what I’ve seen, the standard function of class autobiography is to make middle- and upper-class authors feel guilty, and the lower- and working-class authors feel resentful. But reflecting on my class history doesn’t make me feel guilty. Rather, it confirms the common-sense view that in the long-run, differences in ability and character are the cause of class differences, and not the other way around. Hmmm. Glad you shared a lot more than just the basic “class info” assignment. You’ve really helped put a human face on the blog entries that you write. Thanks for sharing! I’ve wanted to do something like that on my blog about my own intellectual journey. Perhaps I will get motivated to actually do it now. Like all rich kids, you attribute your current position and success to your own merits, and think that your privileged class origin was meaningless in your own special case. Think please, if it were so, why so few working class kid succeed in climbing to upper middle class level? In absolute numbers, there are enough high IQ working class kids to provide a sizeable portion of the middle class, yet they are not there, you cannot see them except as a few individuals. There must be many unseen barriers to realize their potential. Another point: You think the only place for a person like you is in America. You think the rest of the world is a horrible place to be. In general terms, you are right. I am not an American (but Israeli) and think there is (intellectually exciting) life outside America. Some humility would have been in place. J. Klein has it very right. Noisy environments reduce children’s reading scores. Poor people tend to have a stronger sense of group and community cohesion. Mutual aid is naturally very important to them–they need it to get by. Only rich people can afford to be individualists. Imagine never asking any of your peers for a favor or advice ever again. Did your high school guidance counselor address the thirty or so best students in the school and tell them that they should all consider going to community college because it was “just as good” and that they would “get just as good an education there?” Were you told that the sports-oriented state campus that admitted anyone who graduated in the top third of their high school class was “a good school?” Were you told to research college options at your high school’s career center, only to find files full of colorful brochures that told you nothing relevant about the schools? Did your high school offer AP courses, or even tell you of the existence of AP tests? Were you told not to study for the SAT, because it would “artificially inflate your scores, and you’d get admitted to a school where you couldn’t handle the work.” In English classes, did you have to read the same Steinbeck stories that you read in junior high while your friends in the nicer school across town were reading translations of Racine and Moliere? Did a guidance counselor in college ask you if “a four year college was appropriate for you?” When did you learn that Phi Beta Kappa was not a frat? When did you learn that stipends for graduate students were common at good schools and that you wouldn’t have to pay tuition to continue your studies? Have you attended lesser-known institutions, only to realize that the students at the so-called elite schools aren’t much smarter? You overstate what childhood and adoption studies show–They show that identical twins reared apart (and mostly not in dysfunctional homes) are more similar than fraternal twins and that identical twins in the same home are more similar than fraternal twins. Plenty of other studies have shown that a bad environment can do plenty of damage — lack of stimulation, head injury, lead poisoning, etc. Bryan and Arnold and others on this blog, you repeated maintain 1) environment and child rearing are of little importance, and 2)The well being of people born in developing countries is as important as the well being of people born here. 1) Move to the least expensive place you can find, regardless of the schools. 2) Send your children to the local public school. 3) Do not give a dime to your children for higher education. 4) Take all of the money you save doing this and fund the education of children in some developing country. Anyone who cannot do these does not truly believe that there are not some people we care more for than others. I agree with Brian. Poverty in the first world is almost irrelevant as a stumbling block for human development. There are so many options afforded to the poor to help them gain the neccesary skils(free secondary education, for the lucky poor vouchers, scholarships for good academic performance, financial aid). Now if you want to talk about third world poverty as a barrier to development then Im all ears. First world poverty rarely arouses any sympathy within me except in cases of child neglect or abondment. I guess my perspective would be different if I did not have so much personal interaction with poor people who were so incredibly self destructive(DRUGS). Here is mine, very quick. Grew up in Southern California swimming pools on the edge of sprawl. Parents professional. Dad a gentleman farmer. Hit the college campus for fun. Fought the government. Let myself get married and taught my son libertarianism. Burned through Silicon Valley until the dot com bust. Quit working, reasoning that someone else should pay the enormous cost of government. Now I surf the web and sequester carbon in my large central California country lot. A blanket statement like that is not going to get you very far. My father, who grew up dirt-poor in the coal mining/fishing Maritime Provinces of Canada during the depression was the strongest individualist I’ve known. He joined the Merchant Marine at age 16 during WWII and ended up in the US Army where he made a career as an NCO. I’m sure many of the readers here have similar stories. Very nice. Of course you have attacked one of the main planks of modern “liberalism”, in stating that you are who you are based on who you are not based on where you come from, so I am shocked that you’ve been scoffed at as little as you have. My experience with friends is that once you get past just the top 1% in an IQ distribution, class (inside a Western Democracy, US in Particular) becomes _almost_ irrelevant. However, genetics being what it is, there are an awful lot fewer poor kids (with lucky genes) with high IQs than rich ones whose parents used their brains to get rich. I didn’t read The Bell Curve closely enough to remember if there were any studies showing that childhood IQ makes 47x the difference in adult-life than does class. Of course, even if there were, no one would read or believe them. Pleased to know you a bit better. I was very afraid that you had gone to the dark side. “What next” I asked myself, “a post on how Clemenza di Tito is a masterpiece reflective of public choice”. What a relief to see the final product! Steve, becoming an appliance repairman or attending a state university is not a fate worse than death. I suppose it’s typical for someone with superior appreciation for “class issues” to think so, though. once you get past just the top 1% in an IQ distribution, class (inside a Western Democracy, US in Particular) becomes _almost_ irrelevant. Oh! You are referring to a minuscule minority of deviants, and not to the 99% of you! And they do. In absolute numbers, most “working class” kids do grow up having achieved success – maybe not having reached “upper middle class” but only because that is defined in a relative sense – eg not everyone can be “above average”. The middle class kids also must end life successful. You’re missing the point. Of course the vast majority of people care more about their friends and relatives than about complete strangers, and there’s nothing wrong with that. But among strangers, there’s no reason to have any special affection for those who happen to have been born in the same country. Why should I care more about some stranger born in New York City than about some stranger born in Mexico City? >Poor people tend to have a stronger sense of group and community cohesion. >What did your family do to try to keep you from going to college? Did they throw out your standardized test scores before you had a chance to see them? If that is a feeling of community, I’ll stick with my individualist family. Matt: People with high grades and test scores generally don’t become tradesmen or go to third rate state schools. Class issues are money issues, there’s no difference. Scott: Did your father ever ask anyone for advice or a favor? Liberty: that is a good point. I do wish that I grew up in an Asian, Jewish or Catholic working class family instead of a Protestant millenarian one. How does one choose to be born into an individualist family? One cannot choose which family to be born into. But we are best off in a society which allows us to get beyond the circumstances of our birth. In a socialist country with collectiviost ideology, one can never get beyoind the very limited freedoms allowed. Everyone has the right to be equally poor, miserable and enslaved. In a big welfare state country, everyone has an equal chance to be underemployed or unemployed or wait many years for a union job which they will then have to keep forver for fear of never getting another – they can send their kids to school since everyone can go to school but there are no choices regarding school and when they get out of school they will face the same job market you face. You cannot give your kids a better life – the state will give them the same life that you have. In this country, we have the freedom to do better for ourselves. Many people have stories about their limited resources, how their parents never went to school, they were poor immigrants or were born into a poor family, yet they dreamt of sending their children to college and of making a better life for their family. They work hard and are able to do so: the kids become a lawyer or a doctor, then they send their kids off to get a PhD or to become an artist or to build a business empire – whatever they want. This is still easier to do in America than anywhere else on Earth. The possibilities are still endless. Interesting autobiography. You make a convincing case for the importance of individual motivation. However, you would have been less likely to have been selected into ability-selected classes if you were raised in a family who spoke sub-standard English or had poor numeracy skills. Public schools in all but upper and upper-middle class neighborhoods tend to have few spaces available for advanced-track courses. And many strong students find out too late about the existence of AP tests and other important competitive strategies. It is not impossible to become academically or professionally successful without an upper-middle class background, but the process is more difficult and the pathway is usually much less efficient unless good peers/mentors are found. In some places they are scarce. Pat Benatar sang: “You can’t change your past, so don’t let it haunt you.” You have a wonderful story, complete with the privaledge of a weekly allownace! Hey, I know of many poor people, and none come near the IQ of you. I do not doubt that if you were born in Mexico, you would be doing the same thing you are now. My question is: What can be done to identify and help the high IQ individuals achieve their potential, no matter where they are born? My review of Judith Rich Harris’s “The Nurture Assumption” in National Review addressed a lot of these questions about what nurture does and doesn’t affect. I’m an atheist despite sixteen years of my mother’s Catholic indoctrination. I’m also an atheist despite a similar amount of Lutheran indoctrination and I don’t think it has anything to do with some kind of natural stubbornness at all. In fact I’m more likely to think of it as a consequence of my minister father’s technophilia that caused him to seek harmony between science and religion (eg “archeology supports the old testament, science supports the Flood with a vapor canopy theory”) and my mother’s determination to be proud of us no matter what we became. But it sounds like your identity is wrapped up in being a self-made man. Also, I must say, as a German that intellectually, Germany is a waste land and most of Western Europe, too. So, yes, I regard the US as a part of the world worth living in, but I rather more recommend countries where state-run regulatory institutions and laws aren’t yet imposed on its citizens. “both of my parents discouraged my elitist attitudes, but I just ignored them.”: quite brilliant. Last weeks edition of “the economist” had a popular article of some recent research on social mobility. It is not higher in the US compared to most european countries. Rather, it is the highest in the social welfare countries of northern europe. And the world isn’t always so black and white. For example, northern european countries with their large social welfare state have private schools and a voucher program where kids (or their parents) can choose the school of their wish. This is, if I understands the debate in the US correctly, seen as a very hard reform to implement. Still, the “socialists” in some european countries have done it. My apologies to be so harsh, but this is nauseatingly self-flattering tripe. Do you realize that (statistically speaking) more than 50% of your PhD classmates at Princeton had at least one parent with a PhD? That more than 95% of them had at least one parent with four years of college? Heck, when I did my econ PhD at Harvard I was struck by the fact that I was the only one in the entire class whose parents had not been to college (my parents were quite well-off, so no complaints). You should really think a little harder about this and realize that with very high likelihood you would never have gotten a PhD at Princeton if your parents hadn’t already been overeducated and wealthy. You are unfortunately confirming the stereotype that libertarians are all about re-defining their good luck as merit. Mikael, “private schools and a voucher program ..choose the school of their wish. …Still, the “socialists” in some european countries have done it.” And in the UK the Conservatives did it and the Socialists swept it away. From what I’ve seen, the standard function of class autobiography is to make middle- and upper-class authors feel guilty, and the lower- and working-class authors feel resentful. That exactly is the point Bryan and you ought to show some gratitude to those that helped you get that far. I look back at all the kids who grew up in my neighbourhood and how intelligent some were (better than me in class) considering where they are today and the opportunities they could not get because of circumstances beyond their control. How can you assume what you have and claim you got it all on your own ? I cant help but look at all upper-class white males I have met and really question how they got what they got purely on merit. I am now an economics student at LSE. 4 years after my peers have graduated all because I couldnt afford to raise college fees after high school. How can I assume/claim it wont affect my life ? IQ is not all, it is not even important. But lack of humility is a cardinal sin, and your soul will sweat and roast, Brian. In the fifties, the Communist Government of Hungary held countrywide IQ test in the schools, to identify high IQ promising children of true proletarian background. The Rakosi government needed people of this kind for its Communist legitimacy. My parents were politically reliable but my grandparents had been rich merchants, a very big problem for us in those times. Anyway, I was so salient and had such musical talents (I lost them in the meanwhile) that I was sent to the Gorkiy school in the Liget. Our class was 70 – 80% Jewish. I well remember a very blond skinny boy in the first raw, very shy and quiet, we had a special consideration for him, as he was truely from poor peasant family background. He must have been of high IQ, but he felt always uneasy in class, and one day he disappeared. We all protected him, as we believed that proletarians were chosen by history. But he couldnt cope. Conclusion: Somebody give a box to that unbearable four-eye child that thinks he is something. >Last weeks edition of “the economist” had a popular article of some recent research on social mobility. It is not higher in the US compared to most european countries. Rather, it is the highest in the social welfare countries of northern europe. I have had to argue this point so many times that I wrote it up in a short commentary article on my site. What I was discussing was not “social mobility” as measured in those studies. Being born poor and finding the American dream, retiring finally from a job that makes 75k/year after sending your kids to college – that is not counted as mobility in those studies. Oh look, the elite libertarian economists are talking about class. And guess what? They conclude — with a sample size of one — that it doesn’t matter for life outcomes. Yep, total coincidence they grew up in happy households with educated parents with good habits and lots of cultural capital. Their success is due to high IQ, folks. It’s all due to merit, honest. Come on. Is anyone really surprised by this self-deceptive tripe? I wish I was privilaged enough to be able to share my class history. The great paradox of the “class autobiography” is that the only ones with the luxury of publicly sharing their pasts are those with the privilage of job tenture — a perk enjoyed by elites like Dr. Kaplan — or those with boring and innocuous pasts. I’m a professional economist myself — one who coincidentially gets paid to defend the free market. But for god’s sake, I don’t try to justify my political views on the absurd grounds that class is irrelevant. After being professionally snubbed time and time again by rich kids from Brown and Yale and even elitist Harvard assholes like Yglesias — kids with half my IQ whose sense of superiority rested on sailing and vacationing in the Hamptons rather than their ability to work a differential equation or write good copy — I know better. And so should you. Congratulations Dr. Caplan, and all your self-righteous colleagues, for your social success. But don’t think for a minute that you’re fooling the rest of us. I hate to break this to you, but we don’t admire you. We feel sorry for you. Your self-deception is giving free-market economics a bad name. That’s a very funny story, Bryan. My guess is that you were (are?) not elitist because you were smarter than everyone else. You were elitist because not many people liked you and hating “dumber people” was your way of dealing with it. I think that these commenters pouring scorn at you have missed the point that yours is a sad little tale of downward social mobility: your father was an electrical engineer and you are but an economist. You don’t half talk a load of garbage.